An embedded computer is a PC that is integrated into a larger device, often to perform a very specific action. Many embedded computers are single purpose machines, built to collect data, monitor one sensor or control one aspect of a complex machine. Embedded computers are commonly small form factor devices that are easy to install, though depending on the system and its performance and ruggedization needs, an embedded PC may consist of anything from a single board system, to a larger more fully functional computer. Embedded computers are playing a key role in the evolving internet of things. As more and more connected devices come online, systems and machines that can’t connect to the internet themselves are being outfitted with embedded computers that relay collected data to the cloud. Industrial IoT Gateways are being employed by manufacturers, energy management professionals and integrators in a wide range of industries to help connect their legacy infrastructure and allow for remote management and data access. While many small form factor systems can be used as embedded PCs, computers built to be embedded in a larger system often include features that make them better suited for the task required of them. Many embedded computers are passively cooled, as additional moving parts within a larger system only serve to complicate things and can make maintenance more challenging. Embedded hardware must frequently adhere to strict power limitations, making systems with low power draw ideal for embedded uses. Finally, many embedded PC integrators require specialized I/O to ensure easy connectivity with the other parts of the system. 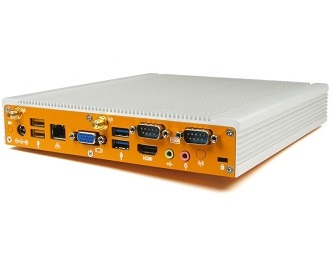 Embedded PCs often feature additional COM ports, Digital I/O (DIO) or even Parallel connectivity based on the needs of the modules and peripherals they’ll connect to. Windows Embedded is a Microsoft operating system (OS) designed specifically for embedded applications. A Windows Embedded installation often includes only the aspects of the OS image that the user needs, saving storage space and simplifying the installation process. With the release of Windows 10 Microsoft has rebranded their embedded OS products, which are now known as Windows IoT. You can read more about Windows Embedded and Windows IoT here.